Hellfest have thrown out a line and we are caught (hooked was just too eazy). The excellent organisers have announced Def Leppard as the latest headliner for this years festival. They’ll be playing on Friday night along with Whitesnake and Twisted Sister. 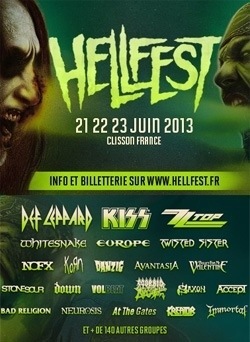 Hellfest takes place in Clisson, France from June 21st – 23rd. Tickets cost €160 for three days or €75 a day. This entry was posted on February 18, 2013 at 9:07 pm and is filed under Gig Listing with tags Cradle of Filth, Def Leppard, KISS, Testament, Twisted Sister, ZZ Top. You can follow any responses to this entry through the RSS 2.0 feed. You can leave a response, or trackback from your own site.